“You must purge yourself before finding faults in others. When you see a mistake in somebody else, try to find if you are making the same mistake. This is the way to take judgment and to turn it into improvement. Do not look at others’ bodies with envy or with superiority. All people are born with different constitutions. Each one’s capacities are a function of his or her internal strength. The beautiful man who wrote this sentiment passed away this week. As much as I love the perspective, I confess it’s not easy to even step back enough, or pause enough to do just that for me at least. Even with my children, I’ve criticized them for faults I have myself. Oh the joys of being human! One of the best parenting moments I ever have had was a few years ago. My oldest daughter and son had been fighting, they were both wrong in their actions and each was demanding some version of discipline for the other’s transgressions. I was upset with both of them for hurting one another and really didn’t have the mindset in the moment to master a quick solution on my own. I was frustrated and sad that they were being so terrible to one another. So, as they were each so eager to demand justice, I said fine, you each come up with a punishment for each other. I warned them not to be to draconian and ensure that what they come up with should be fair. Alas, as each had not given up on their festering anger, the consequences they had each envisioned were absolutely just a small step shy of fifty lashings while tied to a stake. I spoke to them both individually and asked are you really sure that what you’ve decided befits their actions, that the punishment fits the crime? Each hungrily agreed that their sibling deserved their choice and that it wasn’t too harsh. Honestly I can’t remember what they each thought of, but truly at the time, I wondered where these atrocious ideas could even exist in their normally quite kind and loving minds and hearts. I called them together and stated one last time as I had them look in each others faces, are you really sure these punishments aren’t too much? Both, still so heated, readily agreed. So I said ok, you each came up with a penance, but, instead of it being for your sibling, the consequences you’ve decided will be for yourself. The silence for that first few seconds afterwards as they each were stunned in fear of what they had come up with for the other was telling. Both my daughter and son started backtracking, pleading with me, tears streaming, that it was too much, too humiliating and abusive. I reminded them that they each thought these were fair and just to be inflicted on the other, so why is it too much for you? I was crying too, as I said, please learn from this, please grasp that vengeance won’t make it better, cruelty and judgement won’t change what happened, that the golden rule and forgiveness are much better choices. I told them that they needed to apologize to each other and really think about what they thought each truly deserved as a consequence, to be careful of rash judgements when we all live in glass houses. I hadn’t read Light on Life yet, but instead told them the gospel parable, lest he who is without sin cast the first stone. I can’t say they’ve never fought since then, but I know the message was felt and I can only hope that they remember and are learning to pause before reacting and learn their capacities and improve upon them. ❤️here is a nice tribute to Iyengar. It depends on how much you want it. At different stages of time as my practice has evolved, I have struggled with various asana. Some are the usual suspects of ashtanga like Mari D, any form of balance, and my ever changing back bending. I’m a bit more than halfway through the intermediate series and kapotasana has most certainly kept it’s reputation as difficult, both physically and emotionally. The first time I ever went into it, I not only felt like I was having a full blown anxiety attack, but released a kidney stone…seriously. On the comical side of it, I had no idea I even was experiencing a kidney stone, I thought I had hurt my back, so…by the end of the week as the stone was finally breaking up and causing me to pee burgundy, the doctors in the ER thought I was a freak because I was happy and relieved to have a stone as this meant my back was not injured. I’m pretty sure this shows just how certifiably crazy I am. I promise, I hate pain and injury, but with any demanding physical practice, at certain points, things sometimes happen, but by knowing my back was open enough, not torn, nothing tweaked beyond the horrible discomfort of the stone breaking up and working it’s way out of my body, I rationalized that kapo helped heal an underlying health issue. I admit, my husband likes to point out to me that sane, rational people who don’t practice ashtanga may not understand my perspective, but I’m fine with that. I’m pretty sure it’s more than ashtanga that makes me beat to my own drum. Anyway, it’s now been a year and change since that lovely moment in time, and though I now have bigger fish to fry in learning new asana, the evolution of kapo has not always been smooth, far from it. Illness, sleeping funny, cold weather, my mindset, as well as a trip to India all caused minor setbacks, but nothing has been more detrimental than my sweaty hands. I really have had an almost impossible time creeping my hands back and up to my heels and ankles. Towels, wiping my hands, more wet, dryer, I had almost given up on the floor method and was really just attempting to go straight down from the air as I can in an adjustment…sigh, I’m lazy here too, because three or more attempts to “get it” is just so taxing. On the bright side of it, I have really had to get my breathing calm and stable, and much of the time, it is! About three weeks ago, my teacher S told me he had the same issue with his hands and the only mat grippy enough was the lululemon the mat. 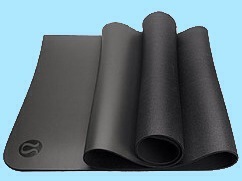 ( though now, over time he can just do it with any mat) I groaned, because, I had tried that mat, and given it away because it smelled so strongly of rubber, and it also wasn’t all that grippy, at least the one I had had before. I love my mat, my space, my manduka…besides The Mat isn’t cheap and from a frugality mindset, there was nothing particularly wrong with my two plus year old manduka pro. I resisted, I decided buying the mat would be an ego based decision and that is not what yoga is about, until of course you start envisioning the easy crawl into your feet on The Mat! So, I did what any sane rational person would do, and caved and bought The Mat about a week ago….and it worked! My hands actually stick to it’s slightly sheened smooth black surface! Ease in kapotasana is almost the most rediculous statement I can make, but hey, it’s working. It has caused me angst though, as I let my desire for grip guide me to make a mostly unneeded purchase. Desire and I go way back, my mom always laughed telling me even as a small child I would say, but mommy I don’t want it, I need it! Well, I guess I still cave to that ego, because I really wanted needed The Mat. Part of practice, of life, are those moments where you really are truly completely mortified. Human moments, I’ve had plenty. I think I sometimes envision my mat as this intimate private space where I’m protected, invisible from judgement, free to explore. Yet, most of the time even though I’m in my bubble, there is usually an instructor in the room guiding the process, as well as fellow practitioners working just as hard, around me. On any given day in the shala, there can be laughter, tears, sighs, moans, grunts, panic, fear, sweat, flexibility, stiffness, injury, pain, accomplishment, meditation, envy, awe, enlightenment, flailing, falls, farts, and smells….yeah, and that’s just in the confines of my own mat! Embarrassment. Yes, I’ve had my moments all throughout every aspect of my life, why would my expectations of these moments occurring in yoga be any different, or less frequent? The physical aspects of attempting asana have taught me so much more than just how to figure out what muscles to use and how to put all the components together to find ease and stability. Non attachment to the outcome and trying your best everyday is a fabulous aspiration, however, it doesn’t stop the epic fails nor days when your best is just plain awful. A sense of humor helps, I just don’t always remember that during these foibles, though in retrospect, it’s been a great salve. As Sharath is planning his next jaunt to the United States, I was reminiscing his last visit here, in April of 2013. A week of led with Sharath is exciting, crowded and challenging under the best of circumstances. Mat to mat next to strangers, acquaintances, and friends, all in the common mass of wanting to practice under Sharath’s guidance. My fear of such a tight space was always related to getting kicked, or kicking someone, but I learned a new lesson in personal space last time. So now here I was in led, trying to loosen up and relax my shoulders once again, but not yet releasing the mindfulness of falling, and not wanting to fall on anyone in such a crowded space! I happened to be next to an acquaintance that day. A very quiet and reserved gentleman who practiced occasionally at my shala. Though I didn’t know him well, his dedication to his practice and his kind if shy nature were both familiar and comforting…So there I was hands clasped behind my back, legs spread, exhaling my head down to the floor. Sharath’s count began and I tried to relax my shoulders open more to get that elusive touch to floor with my hands and not just my head, I did relax and stretch more forward, if the floor was touched, alas, at this point I don’t recall, because, I was so relaxed, for once, in a crowd, in count. It was time to come up and out, I was moving slowly appreciating my inhale, oddly, my hands came into contact with something soft. I wasn’t really thinking, in that meditative zone and all, but I guess in curiosity I groped slightly, trying to figure out what I was in contact with before rising completely. It was this poor innocent fellow’s testes. I was cupping his balls, seriously! Though I’m sure in the cosmos of the universe, this all took place, I’m hoping at least, in a split second of time. In my shock and horror, I flew back, away from his personal space and private parts, and promptly landed on my rear. I couldn’t look at him, and in the mercy of led pace, picked myself back up on the double to get into prasarita D.
There were no words spoken, neither of us ran away, we continued to practice, I was really at a loss for how to address it, and was grateful for the time and asana to diminish my transgression. As we finished up after our final rest, I gave this lovely man a contrite smile with a nod of my head, lowering my eyes in true regret. In it I was trying to convey, hey, it was an accident, I really really didn’t want to fondle you, I’m very sorry for the intrusion and over reach, literally…He very politely gave me a smile and nod back, I hope accepting my unspoken apology because words would just make it more awkward than it was….so yes, I still fail, I make mistakes, and I feel safe in my bubble on the mat, but now keep a little more awareness and though I’ve had my share of mishaps since then, I plan on stacking during prasarita this September with Sharath. I cheated on my ashtanga practice yesterday. It felt really good. I highly recommend it. I’m only half joking in my choice of words as I am a pretty devoted student. However, as a student, I also think it’s important to see outside of the box we each carefully construct for ourselves. Don’t get me wrong, I would never say ashtanga is easy, far from it, I’m challenged every single time I get on the mat, but the difference between trying a new yoga style versus ashtanga is that in my own practice, pretty much the sequence is for the most part, un changing. The differences arise in who I am that day, how I feel both physically and emotionally, the weather, my teachers choices in where to push me and the types of adjustments I may get, or gulp, a new asana to tack on, but I still usually have the comfort of my shala, the usual suspects in the room with me, sustaining our energy together, a comfort zone to anchor me. In another style, well, I may as well be in a foreign country with a guide map written in a language I’ve never seen before. I hadn’t tried any other type of yoga when I first went in an ashtanga room, only when I decided to do a teacher training student immersion, that my teacher told me to venture off the tribe and not just read about other types and styles of yoga but to try them, so I did, for awhile at least. I tried quite a few, some I liked, some, I just didn’t but at some point about two years ago, I just really stuck with my tried and true first love, ashtanga. My sister in law is not just a fabulous person, but as well a fantastic yoga instructor. She teaches vinyasa flow and trained as well as is mentored by a highly regarded instructor. At his shala, they have started teaching a new style called sridaiva. I met her there last night to take an all in hour and a half class. Though, I’m not changing faiths, I must admit, I really enjoyed it and found it vigorous but also restorative and uplifting. I honestly was as sweaty as the most intense Mysore session but had an noticeable boost of energy and sense like I could fly when I was done. It was awesome and fun. Sridaiva, was not just rearranging a sequence, as I sometimes refer to flow styles as ashtanga improv, but a whole different way to hold your body and stay up on your toes, big toe and pinky toe to be exact, ideally with your heels lifted and a bounce thrown in, or not, up to you to find your edge. The posturing engaged bundhas merely through the action in your glutes, spinal curve, rib cage fully open and subtle but active pulling in of the femurs through the glute and thigh action. Everything looked wonky and felt so odd at first, but alas it kicked my asana in the best way, completely new, unknowns, uncertainty, fears, but yet taught and communicated in such a thoughtful, precise, fun, and compassionate way that failures didn’t matter, ego went out the window and some yummy soul soothing vulnerability in such a trusting and guided way was able to manifest within me. What a gift. I was afraid I would be sore and achy today, not because it hurt, but just because it was so different and new, I wasn’t sure if I had awakened any new muscle points, but was happily surprised to feel really good, better, in fact than my old, sore body had felt in quite awhile, my normal twinges were quiet, but I did feel some minor soreness in my lower lats and obliques, in that sweet way of new strength and release of facia.